Guantanamo Bay, Cuba – Omar Nazirr, an Afghani who has been in U.S. custody at the military prison at the Guantanamo Bay Naval Base since 2003, said he has a suggestion for where to put detainees of the prison camp once it closes. Nazirr says the 240 detainees could be moved to a Ramada Inn off I-95 in Maryland. “I’ve been there,” Nazirr said. 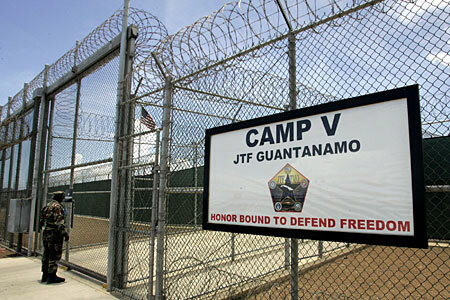 “It’s nice.” President Obama has ordered the Guantanamo prison camp closed by January 22, 2010. There has been a heated debate in recent days over the issue of relocating the detainees following the prison’s closure. Democrats this week refused to grant funds to close the camp until the White House offers a concrete plan for transferring the detainees. Nazirr says he can help solve this problem. Nazirr said because the Ramada Inn is affordable, it might end up saving the United States money. Nazirr did not accept the improbability that U.S. lawmakers would allow prisoners from Guantanamo into the United States at all, let alone let them stay in a hotel.